The Referral Analysis Report displays an analysis of professional, marketing, patient, and other referrals that led to new patients being seen at your office. The report displays the number and percentage of each referral type within a specified analysis period. 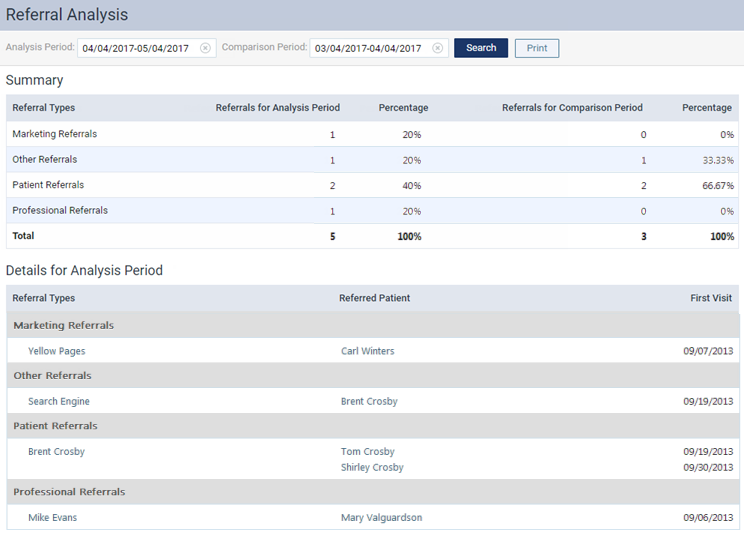 The statistics for referrals within another specified period that you want to compare to the analysis period also appear. Additionally, for the analysis period, the referred patients and their first visit dates appear for each referral type. Note: Only patients with a First Visit Date entered in their patient records will be counted on the report. On the Home menu, under Reports, click (or tap) Referral Analysis. The Referral Analysis page opens. Analysis Period - The date range to analyze. The default period is the past 30 days. You can change the date range as needed. Comparison Period - The date range to compare to the specified analysis period. The default period is 30 days just before the default analysis period. You can change the date range as needed.